Scorpions have a reputation of being more dangerous than many other insects or arachnids, with about 50 species having stings that are deadly to humans. However, it can be difficult to tell the difference between a scorpion sting and a bite or sting from other insects. It is entirely possible to be stung by a scorpion and not realize it. Fortunately, most scorpion stings are more painful than dangerous, especially if they are treated quickly. There are some telltale signs that what stung you was a scorpion. They include intense pain, numbness or tingling around the sting, and slight swelling. The swelling may not be as severe as with other insect bites or stings, making a less-dangerous sting easy to overlook or mistake for something else. More severe scorpion sting symptoms include muscle twitching, drooling, sweating, vomiting, an accelerated heart rate, and unusual head or eye movements. Anybody experiencing these severe symptoms should seek medical attention immediately. Most scorpion stings will not be lethal to humans, but it is always best to err on the side of caution. If you are stung by a scorpion, immediately wash the area around the sting with soap and water. Apply a cold compress to keep the swelling down and alleviate some of the pain. If you were stung on a limb, elevate it to heart level and do your best to keep it still. A medical professional can immobilize the limb that was stung to keep the venom from spreading throughout your body. Most scorpion stings won’t require a lot of medical attention, but in some cases an antivenin such as Anascorp may be administered. This is often used in Mexico to treat the sting of the bark scorpion, one of the few species that can be fatal to humans. The most important part of scorpion sting care is to remain calm. A scorpion sting can be made worse by the increased blood pressure and elevated heart rate caused by stress. Scorpions can be particularly difficult to kill off, but it is not impossible. If you suspect that your home has a scorpion infestation, contact an exterminator near you, especially if you have young children, senior citizens or pets in your home. You should watch out for garbage cans, lumber piles, bricks, old cardboard boxes, soil in potted plants, and in the garden beds as most scorpions are prone to places like that. Scorpions are always on the look out for their next meal, you should always be on the look out for where other insects may be. Also, ALWAYS check your shoes. You have the option of learning scorpion control via YouTube, which it not recommended, or you can hire a profession scorpion control exterminator. Many exterminators in Arizona will rid your problem of scorpions. We can easily get rid of them but our major concern is for them to come back. 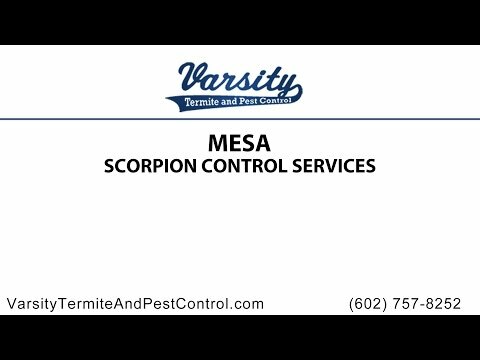 There are a ton of exterminators in Arizona, but Varsity Termite and Pest Control is by far the best. Take a look at some of our reviews for your exterminator of choice. Call us today!